Delivering the Henry Steel Olcott Memorial Oration 2017 in Colombo recently, the Central Bank’s Senior Deputy Governor Dr. Nandalal Weerasinghe outlined the change of the game plan of conducting monetary policy by the bank in the years to come (available at: http://www.cbsl.gov.lk/pics_n_docs/02_prs/_docs/speeches/speech_20171120e.pdf). That was to control inflation directly instead of controlling intermediate factors that contribute to inflation. This novel method – known as inflation targeting or IT – has been adopted by at least 28 central banks, according to IMF, in the globe since late 1990s. The main proponents have been the Bank of Canada, Bank of England, Reserve Bank of Australia, Reserve Bank of New Zealand and Bank of Korea from the developed world and Bank of Thailand and Reserve Bank of South Africa from among emerging economies. Central banks throughout the world have been mandated by people to maintain a stable general price level – or in other words, an inflation-free world – in their respective countries. However, in practice, the goal being pursued is not the attainment of a completely stable general price level or zero inflation rate. It is simply the maintenance of a ‘more or less stable general price level’ or a ‘virtually inflation free world’. What is meant by ‘more or less stable prices’ is that prices could change but in small paces, say, at a rate of about 2% annually. That increase in 2% is viewed as necessary to reflect the improvement in quality of goods and services for which consumers are prepared to pay more. Thus, when that 2% is removed, it is practically an inflation free world. If the change in the general price level from year to year is within this region, people will trust their Central Bank, and hence the Government above it as well, that together they would not disappoint them at the end. Such confidence would create all the incentives for them to take a long-term view of the economy and make appropriate choices on both consumption and investment. But, on the other hand, if inflation is higher than what had been promised initially, they would experience an erosion of the real value of all the financial assets they hold – cash, bank deposits, bonds, debentures and so on. To protect them from the imminent losses, they would increase consumption, reduce investment or convert their financial assets to unproductive real assets such as land, real estate, gold or precious stones or go for a combination of all these three options. They are called unproductive real assets because they are held not for creating wealth but temporarily as a hedge against inflation. If consumption goes up, it would further fuel inflation and to the extent the country is free to import, cause the current account of the balance of payments to record a deficit. If the existing foreign reserves are used to fund this deficit, there would be an erosion of the foreign reserve base. It would put pressure on the exchange rate to depreciate. To avoid such an eventuality, the country would be forced to borrow abroad, thereby increasing its external indebtedness and long-term vulnerability. The reduction in investments in the current period will cause the future growth to decelerate. Thus, the country is the loser on every count if inflation is not tamed. In the present monetary policy practices in which central banks are controlling money and credit to maintain inflation at the desired levels, this is exactly what has happened. At the beginning of the year, a Central Bank would promise its people that it would keep the inflation in check and not allow it to go above a certain maximum level. But, at the end of the year, the actual inflation would be much higher than what had been promised initially. If it happens only in one year, people will begin to believe that the higher inflation is temporary. But if it happens year after year, people will expect inflation to prevail at high levels continuously. Thus, mistrusting both the Central Bank and the Government, they would begin to consume more, invest less and go after unproductive real assets. Sri Lanka had been in this category since around 1980s. Hence, as announced by Weerasinghe, the Central Bank, in a bid to break the vicious cycle, has decided to change its monetary policy practice to inflation targeting. This is indeed a way forward strategy. But its success depends on a number of ground conditions being established in financial, economic and political arenas of the country. From the political side, the Government’s Vision 2025 too has endorsed this proposed monetary policy practice by the Central Bank. This writer in a previous article in this series welcomed the move but warned that the Government should free the Central Bank from the crutches of the Ministry of Finance if the inflation targeting is to become a success (available at: http://www.ft.lk/w-a-wijewardena-columns/Going-for-inflation-targeting---Yes--but-free-the-Central-Bank-from-Ministry-of-Finance-first/885-642771). What it means is that both the Government and the Central Bank will work together to deliver price stability to the country. Thus, the Minister of Finance, the agent of the Government to work with the Central Bank to accomplish this mission, should extend all the support from the Ministry to make it a reality. This is the challenge faced by the new Minister of Finance, Mangala Samaraweera. He should refrain himself from criticising the work of the Central Bank in public as was done by his predecessor both in and out of office. Such destructive criticisms may be appealing to the uninitiated but will give wrong signals to citizens as well as prospective investors. No right-minded investor will choose a country for investment if its Minister of Finance is waging an open war with its central bank. The oration delivered by Weerasinghe is well-researched and well-articulated. It took the audience through the evolution of monetary policy in Sri Lanka and finally made the case for moving into inflation targeting as the Bank’s new monetary policy framework. Weerasinghe had documented that at every point in Sri Lanka’s monetary policy history, the Central Bank had in fact changed its policy framework when it had found the existing system not working or inadequate. In this context, the Central Bank of Sri Lanka has been a flexible institution, ever willing and ready to change its systems if they do not deliver the expected results. Weerasinghe has discussed the evolution of monetary policy in Sri Lanka in the light of different exchange rate regimes that had prevailed in the country. There is a valid reason for him to do so. That is because the freedom which a Central Bank has in conducting monetary policy is restrained by the type of exchange rate policy the country has been following. For instance, if the country follows a fixed exchange rate system, it is mandatory for the Central Bank to keep the rate fixed by buying or selling foreign exchange in unlimited amounts. If the going is good for the country like in the case of a commodity boom, there will be a massive inflow of foreign exchange to the market. Since the supply is much more than the demand for foreign exchange, under normal circumstances, the local currency should appreciate. But under a fixed exchange rate system, that cannot be permitted to happen. Hence, the Central Bank should buy the excess foreign exchange that comes to the country by exchanging local currency. But, it would increase the local money supply putting pressure for inflation to set in. Thus, the Central Bank may be fixing the international exchange rate, but has to allow the inflation rate, known as the domestic exchange rate, to set in the economy. So, a Central Bank is placed in a dilemma in such a situation. While preventing the appreciation of the currency in the foreign markets, it has to prevent the depreciation of the currency in the local market. The Central Bank of Sri Lanka faced this situation in the rubber boom in early 1950s and it had to permit Sri Lankan citizens to keep foreign exchange they earn in accounts abroad. It was similar to Sri Lanka lending to foreigners just like what China is doing today. The opposite happens when there is a chronic shortage of foreign exchange. In that situation, the exchange rate should depreciate but under fixed exchange rate system, that too cannot be permitted to happen. Hence, the Central Bank has to supply foreign exchange to the market to keep the rate fixed. But it loses foreign exchange, runs down foreign reserves and to build reserves, has to borrow abroad. If borrowing is not possible, the Government is forced to cut down the demand for foreign exchange by introducing import and exchange controls. When the ailment becomes acute, stricter import and exchange controls have to be introduced. Since agriculture and industry loses raw materials, it brings down economic growth as well. When there are shortages in the domestic market, price controls have to be clamped. Since they breed black markets, goods have to be distributed through a system of rationing. It not only generates inefficiency, but also breeds corruption. Since prices are controlled, consumer price indices hide the true inflation. The result is the stagnant economy associated with suppressed inflation and artificially maintained high exchange rates. Without foreign reserves, such a system cannot survive for long. Even after the country moved away from fixed exchange rates and adopted a managed floating system in 1977, the problem remained the same. Under this system, the Central Bank had a greater freedom to conduct monetary policy and therefore the ailment was less acute. But the problems which the country had undergone in the previous era were still present with erratic growth, one-way journey to depreciation and open high inflation rates. The bank’s attempt at controlling inflation by controlling money and credit did not succeed since the Government, which ran high budget deficits year after year, had borrowed in large amounts especially from the Central Bank. Such money created by Treasury is known today as ‘fiscal money’ as distinct from the fiat money issued by a Central Bank. Fiscal money, together with fiat money, builds pressure for inflation to rise in the economy. This disappointing experience has forced the Central Bank to critically assess the validity and relevance of the monetary policy framework the bank had been following. The present situation faced by Sri Lanka is a paradox. On the one hand, as Weerasinghe had presented, inflation has been at a single digit level for over 100 months. Yet, economic growth has been less than what its peers had been attaining. The current account of the balance of payments had been eternally in deficit and when the fuel prices were rising in the international markets, such deficits had also been on the increase. Foreign reserves had been built up but not out of earned foreign exchange; they have been built by borrowing abroad. The exchange rate is eternally under pressure for depreciation. Thus, the country has attained ‘price stability’, but not ‘economic and price stability’, mandated to the Central Bank by Parliament. It has, therefore, become necessary for the Central Bank to look for a more effective method of controlling inflation. The solution it has found lies in the introduction of a flexible inflation targeting, as against setting a strict target for the inflation rate. Under the flexible system, in addition to having a low range for inflation, central banks will have a target for real economic growth as well. This fits very well with the explicitly pronounced objective of the present Central Bank of Sri Lanka, namely maintaining economic and price stability. Thus, as Weerasinghe has outlined, the Central Bank would endeavour to maintain the total nominal output of the country, known as nominal GDP, under its strict control. This, as Weerasinghe has explained at the beginning of his oration, amounts to tackling inflation from the demand side. Any increases in the general price level due to disturbances to the total supply, sometimes erroneously called cost-push inflation, have to be tackled by the Government by using weapons it possesses. For instance, if there is destruction of the agricultural outputs due to any natural cause, the Government could still maintain the same price level as before by allowing imports to come in or reducing the import duties. The pre-budget reduction of the prices of a selected basket of essential food items was done by the Government by using this method. The Central Bank’s attempt at introducing a new flexible inflation targeting era is a revolution by itself. 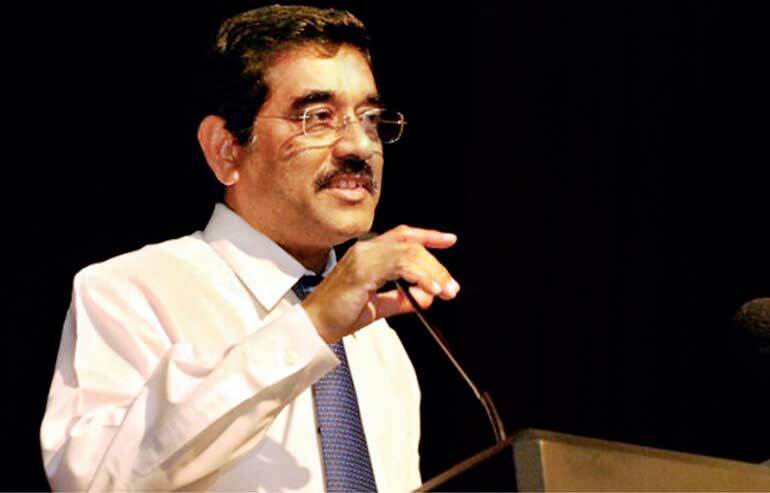 Weerasinghe has said that within the Central Bank a lot of model based research has been conducted to feed the necessary information for the group handling inflation targeting to do its job. This is indeed praiseworthy and a necessity. But at the same time, it is also necessary to educate all the stakeholders of the necessity for and the fine details of inflation targeting. The stakeholders involved are employees of the Bank, politicians on both sides, media, trade unions and the general public. Without stakeholder cooperation, no monetary policy package could succeed. Hence, conducting an effective public education program is a must.